Finally, a Saturday where we didn’t have to do the grab-and-go breakfast! Both hubby and I were in the mood for some spicy tofu scrambles and these came out fabulous. 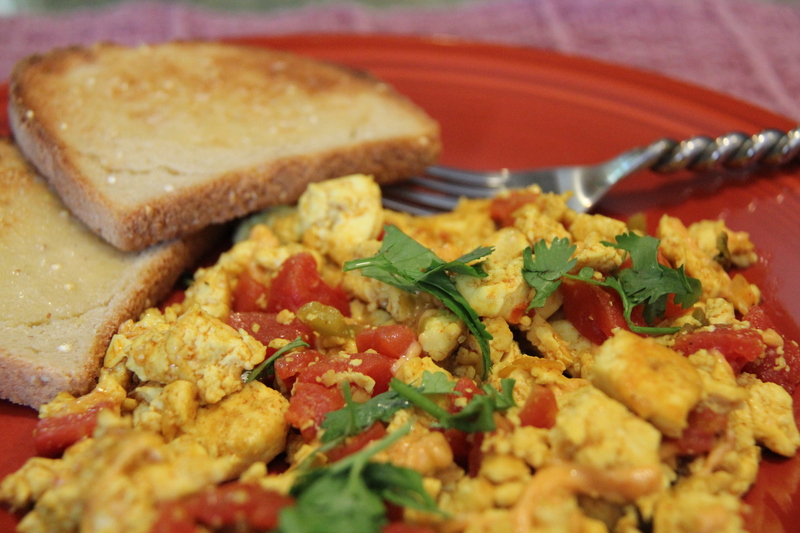 Firm tofu makes the best scrambles and it’s so easy to prepare. One thing I never like about some tofu scrambles is their pasty white color and mushy texture, so I did a little playing this morning and came up with tasty scrambles that look and feel a lot like eggs. The secret? A tiny bit of turmeric. If you add too much turmeric, it tastes like mustard, but if you follow this recipe, aside from the color, you’ll never know it’s in there. And patiently taking your time to sauté all the liquids out will give the tofu a nice firm texture and keep it from getting mushy. Heat oil, add chopped onion and lightly brown. Squeeze excess water out of the tofu, crumble into 1 ½ – 2” pieces (not too small – as they break more when they cook) and add to the pan. Stir on high heat until all the water boils out and the tofu starts to sizzle. Turn down heat and continue to sauté until some of the tofu starts to get lightly brown and a little crisp. While the tofu is browning, combine turmeric, chili powder, paprika and salt into a small container. 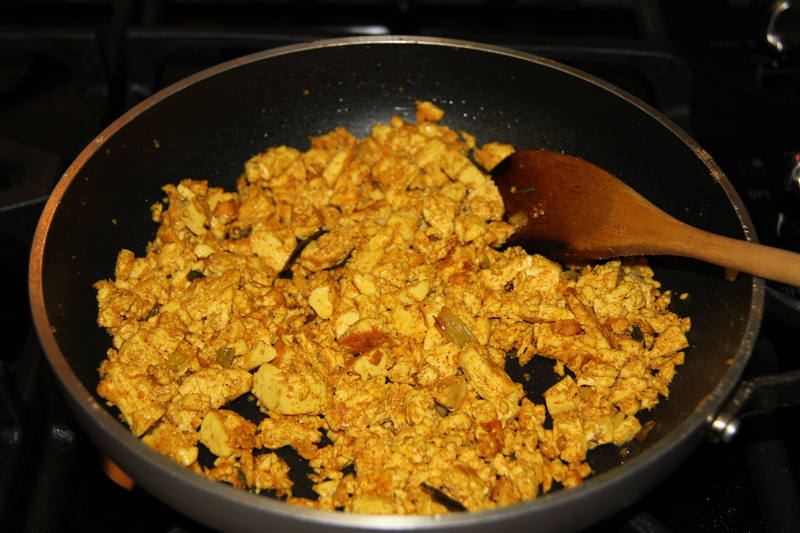 When tofu starts to brown sprinkle the spice mixture and stir until all the tofu turns a nice yellow color. Add salsa and canned chilies. Continue to stir gently until all the excess moisture cooks off. Continue to brown to your taste. Little or no browning gives these a soft scramble texture, more browning make them more like a hard scramble. Top with shredded vegan cheese and cover until cheese melts. Spoon from pan onto plate and top with fresh cilantro. Serve with your favorite gluten-free toast and enjoy! This entry was posted in main dishes, Meals in Minutes, Recipes and tagged cilantro, egg substitute, gluten-free, glutenfreevegan.me, glutenfreeveganme.com, green chili, green chilies, healthy, mexican omelet, Mexico, recipe, salsa, scrambled egg substitute, scrambled tofu, spicy, tofu, tofu scramble, vegan, vegan cooking, vegan recipes, vegan scramble. Bookmark the permalink.